My all time favorite author was Taylor Caldwell. Ms. Caldwell had the unique ability to place the reader in the midst of the subject, and subjects, in her books. Obviously this quality enhanced the interest and enjoyment of reading her books. I read many of her books and some of them still resound in my memory bank. In reading the subject book, I was delighted to find that Mr. Dunne also possesses this very impressive quality. His knowledge of the "909 Days," and his ability to place the reader in that time era, absolutely elevated the interest in his book. My wife is now reading the "909 Days" and am certain that many of our friends will be doing the same. I hope that Mr. Dunne has another book in the works, I would truly look forward to reading his next book. After many years of hearing the gospels of Matthew, Mark, Luke, and John, Robert Dunne has completed the remarkable task of using the gospels to create a cohesive story of Jesus’ public ministry. His book, “909 Days That Changed the World” has allowed me to not only begin to understand but also appreciate how Jesus’ role as both God and man evolved during these 909 days. 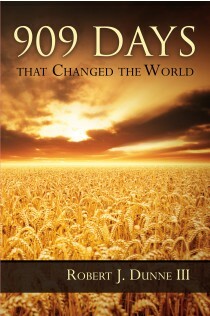 If you are someone who believes in the power of prayer, I strongly recommend reading “909 Days that Changed the World”. For me, reading a chapter a day was an inspiring way to move closer to Jesus. What began as a daily ritual transformed into an excellent opportunity to enjoy some quiet time after a busy day, reading and reflecting on the word of God found in the gospels. By reading my favorite stories in select chapters, I was able to gain a new and deeper understanding and appreciation for the message of the gospels. When Jesus asked the blind man, Bartimeaus, “What do you want me to do for you? ”, he replied, “Master, I wish to see.” His response should serve as a lesson to all of us. The book “909 Days that Changed the World” serves as a powerful tool to allow us “to see” what God wants for us. I strongly recommend this book as a special gift to anyone, including oneself, seeking a closer relationship with Jesus. I am a product of public school, hence, no religious education other than preparation for the sacraments of Communion and Confirmation. Whatever I learned was on my own. The book, the story of Jesus Christ's journey on earth, permitted me to connect some of the dots in an every day language story. In my opinion, "909 Days" is a good read for all; a book of history. I found it of an autobiographical quality.